The beloved taco pop-up is about to open its first brick-and-mortar location in Oakland’s Temescal district. Every taco comes on handmade tortillas. After years of popping up all over Oakland and the East Bay, Oscar Michel and Jake Weiss of Tacos Oscar are gearing up to open their first brick-and-mortar location at 420 40th St., Oakland on Dec. 6. The brick-and-mortar has been in the works for over a year. 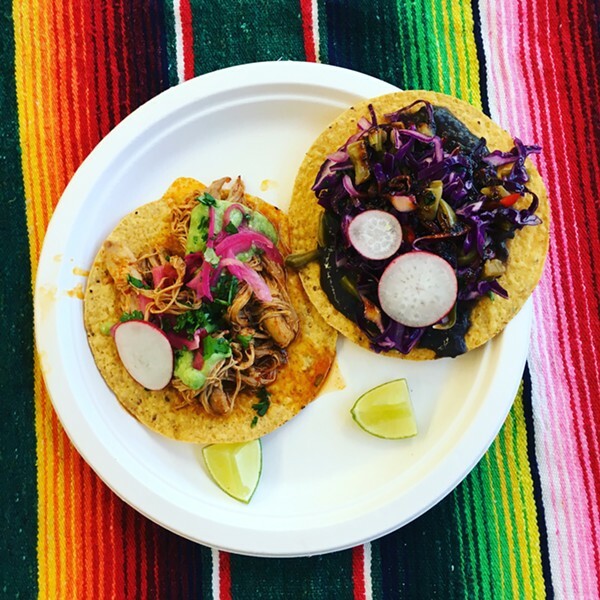 Tacos Oscar has popped up at Oakland locations like Temescal Brewing, Cole Coffee, Starline Social Club, and Subrosa Coffee, as well as Flowerland in Albany. While Michel and Weiss are accustomed to working with limited kitchen space, their new brick-and-mortar is much roomier, located inside modified shipping containers. There’s also enough outdoor seating for up to 49 people. Michel told the Express he plans to keep the menu simple for now. “What I would like to see is people hanging out and drinking beers and just eating tacos like it was a stand in Mexico City or LA,” Michel said. There’ll be a quesadilla, a carnitas taco, a vegan taco with persimmon habanero salsa, and of course, the fried egg tacos that Tacos Oscar has become famous for. Michel said he didn’t intend for fried egg tacos to become his signature item, although he certainly enjoys them. “I grew up in a Mexican household, and … I’ve had this growing up: a fried egg on a tortilla with some salsa, a little bit of cheese,” he said. But when Michel went to Austin to play music in a band, he became enamored with the breakfast tacos there. “We were looking forward to being hung over so we could get breakfast tacos the next day,” he said. But back in Oakland, Michel didn’t know of any other place in the area that sold fried egg tacos. Drawing up his logo while working at his desk job as an office manager at Urban Ore, Michel wrote out “Tacos Oscar” in cursive letters, with fried eggs standing in for the letter “O.” Now, customers have come to expect fried egg tacos at every Tacos Oscar pop-up, and Michel says some customers have even brought their own eggs for him to cook. The bigger kitchen at the brick-and-mortar space will also allow Tacos Oscar to expand its culinary offerings. Michel and Weiss plan to eventually introduce lunch service. They also plan to add sides, salads, and soups to the menu. The brick-and-mortar also has a unique physical layout with high walls, which Michel is thinking of using to screen movies. He’s also considering bringing live comedy to Tacos Oscar. Tacos Oscar will be open Thursdays through Mondays for dinner only — the exact hours have not yet been determined. … In other food news, West Berkeley-based Fieldwork Brewing has expanded to a total of six Northern California locations with its new outpost in San Ramon (6000 Bollinger Canyon Road, Suite 1206), which opened on Nov. 8. The space, located within the City Center Bishop Ranch shopping center, features a 2,400 square feet indoor taproom and a 2,700 square feet outdoor beer garden. Also, coinciding with its first anniversary, Copper Spoon in Oakland (4031 Broadway) has unveiled the Golden State Lounge, a revamped back room serving cocktails and a menu of bar bites. Notable offerings from the bar bites menu include a king salmon hand roll, Marin Miyagi oysters, and cauliflower served with fermented hot sauce. There’ll also be a happy hour from 4 p.m.-6 p.m., Monday through Friday.